Harriet Burden; struggling artist, mother of two and the widower of Felix Lord, a famous art dealer. Fed up with the sexist art world, where a man is more likely to get praised than women, she plots a project where a man should play the role as the artist behind her art. The unfolding of Harriet Burden and her project is done after Harriet’s death by a professor Hess through a number of interviews and Harriet’s notebooks. Harriet chose three very different men for her maskings project. The first was a black gay man, the second a young man, and the third was an already quite famous artist, Rune. The project went well until Rune, and no one believed that Harriet was behind it all. I have been having a hard time with this book and I think I finally can put my finger on why. I think it’s because it simply became too technical for me. It is written in a very scientific way with footnotes and references to both fictional and real work. For people interested in psychology and neuroscience, this must be a great read, but I’m not. And that’s why I couldn’t really enjoy this book, despite it being well-written (especially towards the end) and I rather enjoyed the feminist approach. The Blazing World is on the Man Booker Prize 2014 long list, the first year the prize includes American authors as well. This was the first book out in Clementine’s Booker reading circle, and I’m excited to read the short list in the coming year. 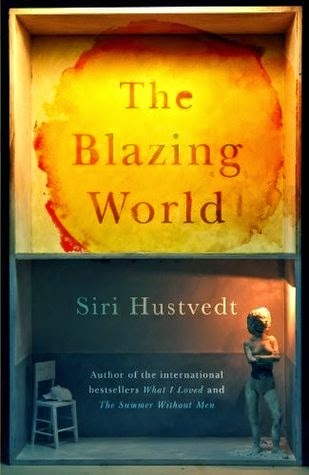 And this will not be the last Hustvedt I read, despite not quite getting into this book.